In the second half of the nineteenth century, Americans swarmed to take in a raft of new illustrated journals and papers. Engravings and drawings of “buckskinned braves” and “Indian princesses” proved an immensely popular attraction for consumers of publications like Frank Leslie’s Illustrated Newspaper and Harper’s Weekly. Today the UIP announces a new book studying this phenomenon. 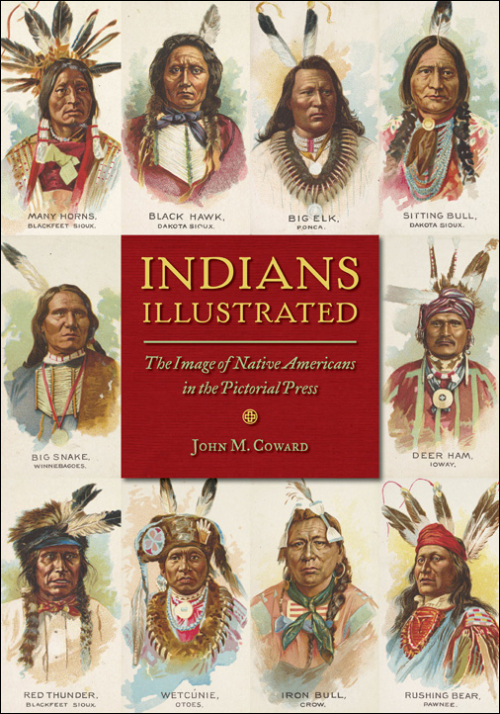 In Indians Illustrated, John M. Coward charts a social and cultural history of Native American illustrations–romantic, violent, racist, peaceful, and otherwise—in the heyday of the American pictorial press. These woodblock engravings and ink drawings placed Native Americans into categories that drew from venerable “good” Indian and “bad” Indian stereotypes already threaded through the culture. Coward’s examples show how the genre cemented white ideas about how Indians should look and behave—ideas that diminished Native Americans’ cultural values and political influence. His powerful analysis of themes and visual tropes unlocks the racial codes and visual cues that whites used to represent—and marginalize—native cultures already engaged in a twilight struggle against inexorable westward expansion. Fascinating and provocative, Indians Illustrated reopens an overlooked chapter in media and cultural history.